With such a comprehensive rise in research reports and studies on the topic, there seems to be an explosion in the marketplace and CBD seems to be available to buy as oil, edibles, crystals and more. 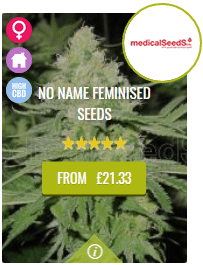 Now, there is a wide range of high CBD strains with many breeders offering different therapeutic and medicinal properties. The general idea is that THC is not the dominant cannabinoid, meaning the user can still enjoy the physical effects as well as great yields, deep tasting flowers and wonderful aromas but will not be overwhelmed with the strains psychoactive properties. Below is a list of the top 5 high CBD strains we recommend for 2018. With high CBD strains comes therapeutic benefits which can cover medical conditions ranging from arthritis, cancer, Fibromyalgia, Inflammation, Insomnia, Muscle Spasms, Nausea, Pain, Parkinson’s, Spasticity, Spinal Cord, Tourette’s Syndrome, Epilepsy and more. With a perfect ratio of 1:1, CBD Hash plant is a brilliant strain for anyone who wants fast flowering indica plants, with an equal amount of cannabinoids. 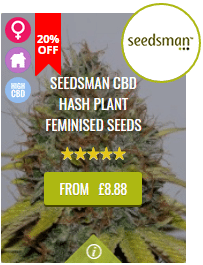 Using the original famous Hash Plant, this high CBD strain will flower within 7 weeks and produce earthy sweet flowers that perform very well outdoors also. The effects when smoking CBD Hash Plant will be very pleasant and calming, so this is ideal for any patients who do not enjoy high THC dominant varieties of cannabis, yet are still looking for the medicinal benefits. As the name of this high CBD strain suggests, it is very rewarding for hash making or extraction which is mainly what high CBD strains are grown for in the first place. 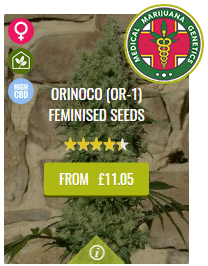 As recent winner of the best CBD strain at Spannabis 2017, Orinoco from Medical Marijuana Genetics is a high CBD strain with a huge 15.56% CBD content. The cross is Mango Cheese x Candida making this sativa dominant strain one with intense fruity flavours and a super medicinal plant at the same time. The effects are more sativa influenced meaning despite this being a high CBD strain, it will allow the user to be more creative and uplifted than totally couch locked. This is the latest cross from Medical Marijuana Genetics so you can expect the best from this award winning strain that takes 9 weeks to fully flower despite its heavy sativa lineage. No Name is a cross of Cheese and Sensi Star, both well known knock out indicas that originate from the Afghani lineage. So it is no surprise this is a high CBD strain which is also very rich in THC. No Name will flower is 55-65 days and the aroma of the flowers are similar to Cheese and Kush, so ensure your carbon filters are working when growing this high CBD strain out. This is a very potent plant and one for professional smokers if it used as a recreational smoke, as it can have a very sleepy narcotic effect. Candida is a hybrid of ACDC x Harlequin resulting in a CBD rich strain that has a ratio of up to 20:1 CBD:THC. This strain will take only 9 weeks to flower to reward the grower with a citrus skunky odour. It is recommended to grow Candida for medicinal value and this is a superb strain to make extracts with for medical patients. 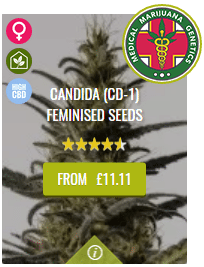 Candida is also a good building block for anyone who is breeding their own CBD dominant lines. This is truly medical cannabis at its best and a top selection for those who want to enjoy the therapeutic side of cannabis with minimal psychoactive properties. 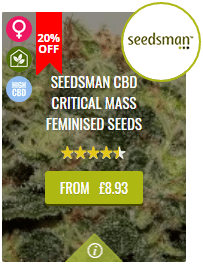 Another high CBD strain by Seedsman, CBD Critical Mass is a cross of Mr. Nice Critical Mass x Remedy. For those who are familiar with the abundant 500g per square meter harvests from Critical Mass, this hybrid has lived up to her name. With cannabinoids of around 6-8% THC and 6-8% CBD, you can experience the therapeutic balance at a 2:1 to 1:1 ratio. This strain is perfect for a sea of green set up indoors and also extremely rewarding when grown outdoors. This hybrid will take 8 weeks to fully mature with large sized buds and a classic skunk odour. With a 1:1 ratio, now you can enjoy the fruity old school funky flavours of the Critical with a calming sedative body high and an abundance of CBD rich flowers.